The past couple of weeks/months have been a roller coaster for me. 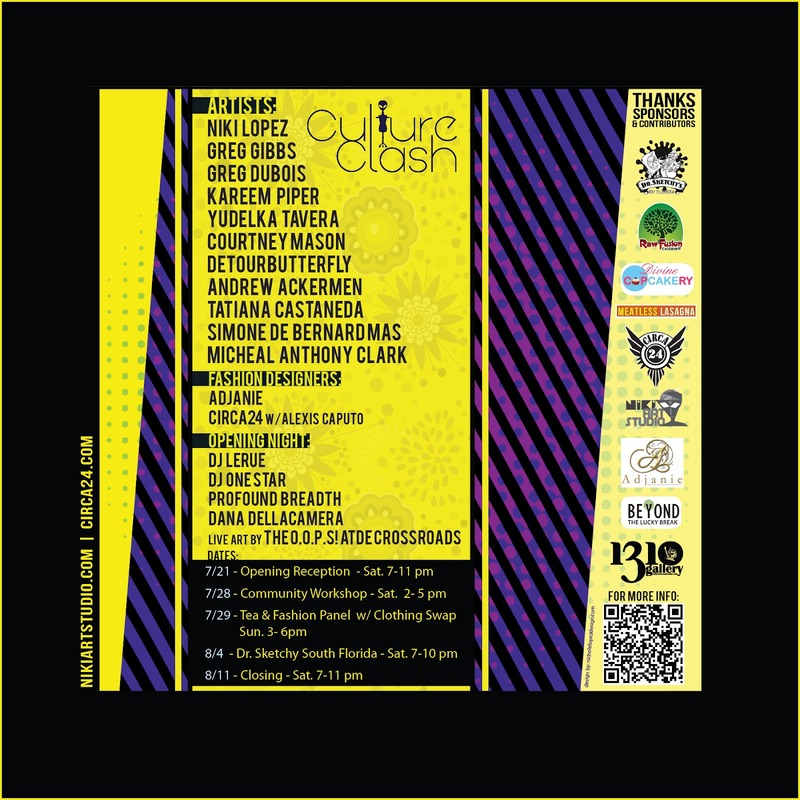 Culture Clash, my fourth major curated show at 1310 Gallery in the Sailboat Bend Artists Lofts of which I have had the pleasure of being one of the original members. Finally getting certified as a working artists within my county. Ton of great information from the Broward Cultural Division. This year, i've teemed up with new member Asanyah Davidson of Circa24, and over 10 talented artists, and tons of local collaborations and sponsorships. As well as a first piece in a new series for me which is a big step from being locked away in my sketch book for ever 3 years. I really tried to have fun and be more intentional with my art, directions, and creations. One of the artist from the show and I had a phone interview and write up with the Sun-Sentinel. So just a ton of great energy surrounding the show. Each week has a different theme and focus so its been an interesting ride. Opening night we had a 2 designer fashion show by Circa24 and Adjanie, my super talented cousin Profound Breadth out of Atlanta joined us, as well as special performance by life mother alien singer, host DellaCamera of Nakedown , and over 200 art patrons, artists, and friends. The following week we had a day tour with some young adults who was talking about creativity in school. They were able to tour the gallery, walk through some open studios, participate in a demo by resident photographer Tabatha Mudra, as well as get some critique of their work by working artists. Sunday there was a Tea & Fashion panel discussion and clothing swap. 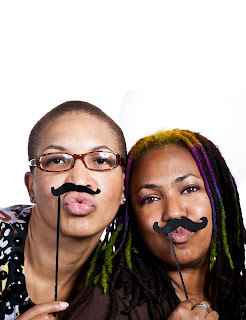 If you are local and reading this, we have two more events Saturday, August 4th at 7-10pm we have Dr. Sketchy South Florida with Betty Pickle with Charlotte Sundquist of South Florida Artist Association. The closing will be August 11th at 7-11pm. 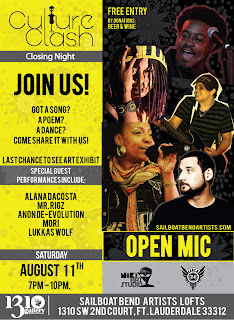 We will have a open with along with some performance and spoke word by a youth dance group, Alana DeCosta, Mr. Rigz, DellaCamera, Vibez, and Mori. 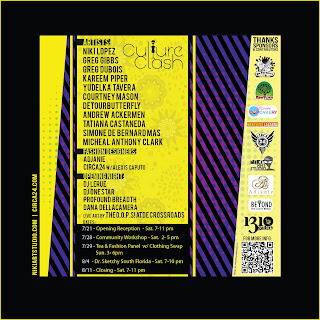 Culture Clash explores how modern influences affect our perspective of unexplored truths and ancient tradition. Art, fashion and aliens. What else do you need? Her co-curator, Asanyah Davidson, creative director of the apparel company Circa24 LLC, found a synergy with Lopez’s mission. Her fashion line is described as fierce sophistication, and she’ll reveal her new Grace Jones-inspired evening line on opening night. About the curators: Niki Lopez is a multi-disciplinary visual artist, graphic designer, and art teacher. Her often 'other-worldly' art has been featured in local and national publications, as well as exhibited across South Florida. 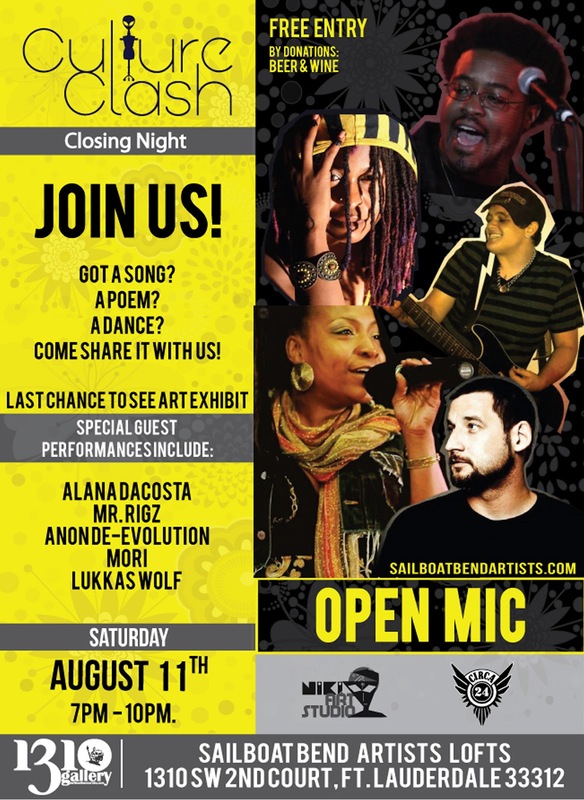 She is an Art Institute of Fort Lauderdale Alumni, member of the Broward Arts Guild, and Artspace’s Sailboat Bend Artists Lofts. 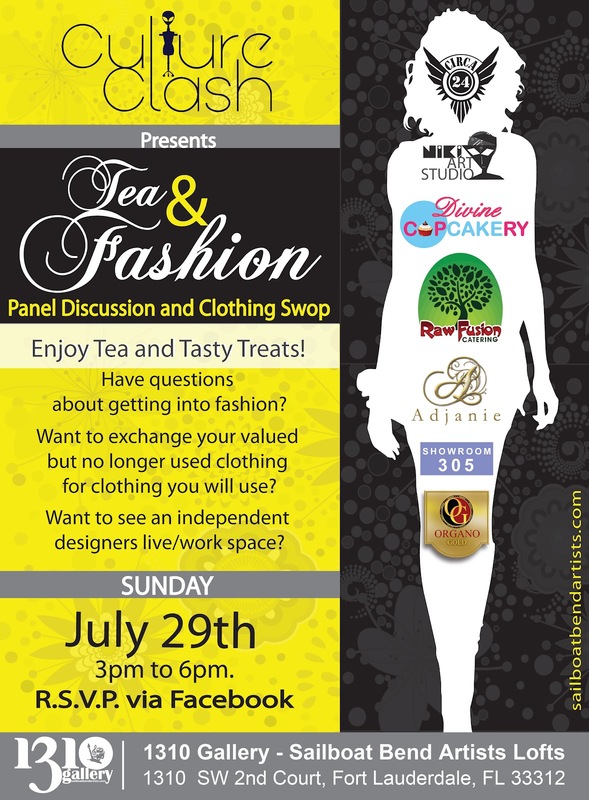 Asanyah Davidson is a Fashion Designer born in Clarendon, Jamaica, is owner of Circa24 LLC. as well as Adjunct professor at Ai Miami (Fashion Dept) and Broward College (Continuing Education Dept). Circa24 promises the convergence of simplicity, lush-sophistication and feminine lines that deliver distinction and command attention.